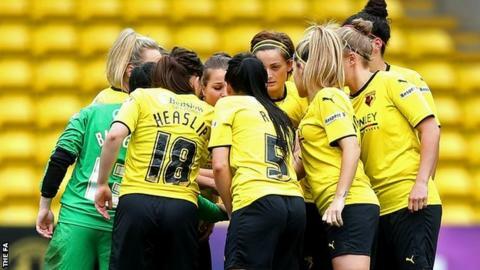 Watford Ladies striker Ellie Mason says is will be "weird but exciting" to face her former club Chelsea in Continental Cup Group One on Wednesday. Mason, 19, spent four years at Chelsea before re-joining Watford - where she was previously a trainee - in April. Watford host the Blues at Berkhamsted FC, with Chelsea looking to bounce back after losing to Arsenal on Sunday. "I'm really excited. I am nervous, but it will be a great experience against top players," she told BBC Sport. Ellie Mason has scored two goals in nine appearances for Watford so far this season. "Chelsea was a great time in my career. If I hadn't been there, I don't think I would be where I am now. "I know quite a lot of the Chelsea girls and played with quite a few of them. I will be weird playing against them but it will be good to see them again." The Lady Hornets have picked up just four points from 13 Women's Super League Two games so far in 2015. "I think the Continental Cup will be good for the whole team, to get more minutes under our belt," Mason added. "When we played Arsenal and we didn't concede in the second half, I thought that was a great performance against them. "It would be good if we get some points under our belt. It will be good experience for some of our players, because our squad is quite young."